I've been threatening to do it for awhile, and here I am... Blogging. This is one I wrote last year for the Hearts @ Home blog. I thought I'd start with it. I find it entertaining that I am writing about a God Mirror when this is something I really need to consult in my own life right now. Recent problems with our boys and their behaviors (one struggles with his speech – stuttering – and the other has tics) have made me wonder what God wants me to do! More and more concerns seem to keep heaping themselves upon my spirit! Which doctor is best for my kids? Will my insurance cover the treatment? What’s the best method of treatment? Do we medicate or not medicate? These questions are overwhelming to consider for children who were perfectly healthy (at least I thought so) until early 2008. How can I cope? I need to bring it to my God Mirror. What’s a God Mirror, you ask? Your God Mirror reflects your world back to you the way God sees it, not the way you see it. You see, God has divine perspective on all aspect of our lives. When things seem so overwhelming that we continue to focus on them, it makes them even heavier on our hearts. Then, we begin to feel that we can never dig ourselves out from under such a pile of junk. Been there? I am right now! Bring it to your God Mirror and He’ll show you how things really are. A little Divine perspective never hurt anyone. Maybe it is a big deal. Maybe it’s not. We’ll never know until we ask the only one whose answer is always right. In the same vein, we can be a God Mirror to others. We don’t always see in ourselves what God sees. We see all the warts and scars, while God sees all the goodness and kindness. Remember, God took the ugliness of our sins away from us as far as the East is from the West. That is what others should see in themselves when they meet us as Christians. Then, we’d have no reason to wallow in our own self pity. 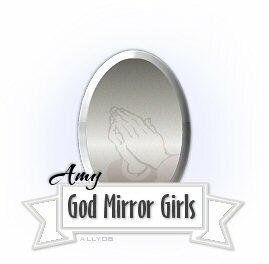 Try to be someone else’s God Mirror today, and take your heart to your own God Mirror. You may be surprised at what you see.